Position I: The timing of the intermittent wipe adjusts automatically to the speed of the vehicle. 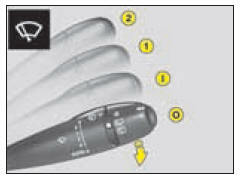 Position 1 or 2: when stationary, the windscreen wiper speed automatically reduces. As a safety precaution, the wiper system is deactivated approx. 1 minute after the ignition has been switched off. - change to the position desired. AUTO position: press downwards to activate automatic wiping. Press downwards: Automatic wipe activated. Note: A press downwards triggers a single wipe, but without deactivating automatic wipe. Go to position I then return to position 0. Do not cover the rain sensor, which is visible from the outside of the wind-screen, behind the interior rear view mirror. When washing the vehicle, switch off the ignition or deactivate automatic wiping. To operate the windscreen wash, pull the wiper stalk towards you. Screen wash is accompanied by a timed screen wipe, the headlamp wash also operates if dipped beams are switched on. Timed rear screen wash/ wipe. On engaging reverse gear, if the front wiper is on, the rear wiper starts. Activation/deactivation of this function is possible in the menu "Personalisation- Configuration"of the "Main menu". Deactivation of this function is necessary when a bicycle carrier is installed on the tailgate. The wipers should be stopped in the maintenance position (during replacement). Switch off the ignition and action the wipe stalk within one minute. The wipers will position themselves in the middle of the windscreen. For this, switch off the ignition then, within one minute, action the wiper stalk. The wipers will position themselves to the centre of the windscreen. For optimum wiping performance, replace the wiper blades as soon as they leave traces on the screen; otherwise change them once or twice per year (in spring and autumn, for example). Always check that the windscreen and rear screen wipers can operate freely, for example if fitting a bicycle carrier, or in freezing temperatures. Remove any accumulation of snow from the base of the windscreen.